On the trail of Baba Yaga, the heroes find themselves transported to the barbaric land of Iobaria on the far-off continent of Casmaron. They must explore three ancient, mystically linked dungeons in search of more clues to the fate of the Queen of Witches, while contending with savage centaurs and demon-worshiping frost giants who seek to claim Baba Yaga’s secrets for themselves. 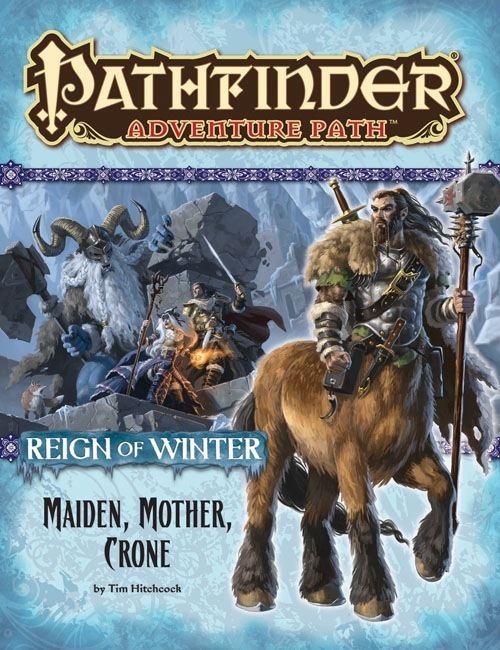 “Maiden, Mother, Crone,” a Pathfinder RPG adventure for 7th-level characters, by Tim Hitchcock. A gazetteer of the Dvezda Marches—a cold and isolated region of Iobaria populated by centaur clans and dotted with ancient ruins. A glimpse into Irrisen’s eerie relationship with dolls in the Pathfinder’s Journal, by Kevin Andrew Murphy. Five new monsters, by Jason Nelson and Sean K Reynolds.